Cliff Richard : Love Songs CD (1981)Title: Love Songs Artist: Cliff Richard Genre: Rock/Pop|Pop Duration: 60.20 mins Format: CD / Album Type: CD No. of Discs: 1 disc(s) Studio / Label: EMI Classics UK Release Date: 15 Jun 1981. 1989 EMI CD single in card picture sleeve, CDEM92. Condition CD is Mint, card picture sleeve has slight wear on the edges as in the pictures, condition Ex-. Cliff Richard - Love. The Album (5099950937028). 2007 UK CD. 1 Waiting For A Girl Like You. This CD Is In Excellent Condition . 13 All Out Of Love. 4 If You're Not The One. 9 The Twelfth Of Never. This is one of my favourite Cliff Albums. This is a must for all Cliff fans and collectors of his music. CLIFF RICHARD. Healing Love. clif richard. UK £0.00, extra copies add £0 per item. UK Parcel Force 48 hour £9.50, extra copies add £9.50 per item. We have offices near London in the UK, Las Vegas in the USA, Hiroshima in Japan. Cliff Richard : 1950s CD (2002)Title: 1950s Artist: Cliff Richard Genre: Rock and Roll|Rock and Roll Duration: 37 mins Format: CD / Album Type: CD No. of Discs: 1 disc(s) Studio / Label: EMI Gold UK Release Date: 24 Jun 2002. Love Is The Strongest Emotion 4.12. Brother To Brother 4.24. Healing Love 5.01. Never Let Go 4.09. Human Work Of Art 4.39. Hold Us Together 4.46. I Need Love 3.45. The Wight Sounds. ( & ) KINDA LATIN. CLIFF RICHARD. -- THE CLIFF RICHARD CD COLLECTION SERIES --. 1992 EMI RECORDS LTD. LOVE IS FOREVER. 2 CD / 2 ALBUMS. CASE CONDITION / GRADE. 2008 EMI 2xCD Album. Cliff Richard - 50th Anniversary Album. Both Discs:- EXCELLENT/MINT! CLIFF RICHARD - LOVE. THE ALBUM (CD Album). In superb condition with picture booklet in a stickered jewel case. The booklet has a light clip crease. Waiting For A Girl Like You. All Out Of Love. If You're Not The One. 1987 UK CD. This CD Is In Excellent Condition . Always Guranteed. My Pretty One. Album title: Rockin' With Cliff Richard. Artist: Cliff Richard. Year of release: 1997. Condition: CD in Ex. Looks almost like new. Recording mode: Stereo. Recording type: Studio. CLIFF RICHARD - HUMAN WORK OF ART (CD Single Part 1). Housed in a double digipak case with room for Part 2, which is not included. Human Work Of Art. CLIFF RICHARD - SOULICIOUS, CD ALBUM, (2011). Cliff Richard : Love. The Album CD (2007)Title: Love. The Album Artist: Cliff Richard Genre: Rock/Pop|Pop Duration: 57.40 mins Format: CD / Album Type: CD No. of Discs: 1 disc(s) Studio / Label: Liberty UK Release Date: 12 Nov 2007. Cliff Richard: The Whole Story. Cliff Richard. A comprehensive look back at Cliff's greatest hits. (c) 2000 EMI Records. The Whole Story. CD Double Album. Unmarked discs. Good clean case and cover (see photos). Another great Album by the Legendary Cliff Richard. Produced by Cliff himself with Paul Moessl and others. My favourite song is 'I Still Believe in You', which is SO beautiful. This Album is another must for all Cliff fans and collectors of his music. CLIFF RICHARD - THE WHOLE STORY - HIS GREATEST HITS - 2 CDS - NEW!! CLIFF RICHARD- THE WHOLE STORY- HIS GREATEST HITS. NEW - BUT NOT SEALED! ON THE BEACH. THE YOUNG ONES. MY KINDA LIFE. THE CDS ARE NEW AND UNPLAYED. THE CDS, CASE AND INSERTS ARE IN PERFECT CONDITION. 4.5 out of 5 stars - CLIFF RICHARD - THE WHOLE STORY - HIS GREATEST HITS - 2 CDS - NEW!! 11 product ratings11 product ratings - CLIFF RICHARD - THE WHOLE STORY - HIS GREATEST HITS - 2 CDS - NEW!! With a different collection of songs from his earlier material, as shown on the second photo, this Cliff Richard CD from 1998 is a must for Cliff fans and collectors of his music. This is one of my favourite Cliff Albums. TITLE: Cliff Richard the Album. Acceptable - The disc plays perfectly, but is otherwise the worse for wear. Very Good - Plays perfectly. The jewel case might show limited signs of wear, as might the inlay notes and inclusions. CLIFF RICHARD - PRIVATE COLLECTION 1979-1988, CD ALBUM. 5 out of 5 stars - CLIFF RICHARD - PRIVATE COLLECTION 1979-1988, CD ALBUM. 22 product ratings22 product ratings - CLIFF RICHARD - PRIVATE COLLECTION 1979-1988, CD ALBUM. Cliff Richard. This is anOFFICIAL, GENUINE CD ALBUM. DISC LIKE NEW. Actual item for sale shown in the photographs. Need further information about this item?. CLIFF RICHARD. UK, 2 CD PROMO ALBUM OF. CD ALBUM FROM:- CLIFF RICHARD - THE ALBUM. Love Is The Strongest Emotion. AVAILABLE WORLDWIDE - £5.50. Brother To Brother. Healing Love. Never Let Go. Human Work Of Art. Hold Us Together. Audio CD(8 Sept. 1990). Product details. The Young Ones (2005 Digital Remaster). The Girl From Ipanema (1992 Digital Remaster). The Only Way Out (2002 Digital Remaster). Abraham Martin And John (1992 Digital Remaster). Price : £7.99. Record Label: EMI Records. "Case / VG - Disc / Excellent". Fire & Rain. Power To All Our Friends. Help It Along. Needing A Friend. Why Should The Devil Have All The Good Music. No One Waits. Green Light. 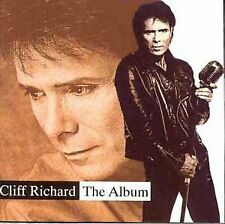 Artist Cliff Richard Title Listen to Cliff Release Date 1998-06-01 Label: EMI Records Number of Discs 1. I Could Easily Fall (In Love With You). With The Eyes Of A Child. Sing A Song Of Freedom. Spanish Harlem. Fire & Rain (Live). I'm Walkin' The Blues. "D" In Love. A Voice In The Wilderness. Cliff Richard ‎– Love Songs. Written-By –Welch ,Richard . 17 When The Girl In Your Arms Is The Girl In Your Heart. 7 I Could Easily Fall (In Love With You). C 1984 EMI Records Ltd. 10 A Little In Love.